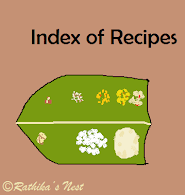 Large chick peas or kabuli channa or whole Bengal gram (பெரிய கொண்டைக் கடலை) is not generally used in traditional Brahmin cooking, as against the small chick peas (சின்ன கொண்டைக் கடலை), which are used to make sundal or kuzhambu. However, gravy made with kabuli channa is much sought after as an accompaniment to chapatti or poori. Channa is also used in the preparation of various chats. Chickpeas are rich in protein, carbohydrates, vitamin B complex, iron, phosphorus and zinc. Channa masala is quite popular in my home and this recipe works great for me. Just give it a try. Method: Soak kabuli channa in sufficient water over night, drain the water in the morning and pressure cook with 1½ tumbler (300ml) of water for 15 minutes. Once the pressure subsides, remove channa from cooker. Transfer a quarter of cooked channa into a bowl and mash it well with a flat spoon. Keep aside. Squeeze the lime and extract the juice. Add green chillies, ginger and a pinch of salt. Mix well and keep aside. Roast cumin seeds, coriander seeds and pepper corns in a kadai till cumin seeds start to crackle. Switch off the fire and allow the ingredients to cool. Later powder the fried items using a mixer-grinder and keep aside. Heat oil in the kadai, add cinnamon, cardamom and cloves, and fry for 30 seconds. Then add chopped onions and fry till they turn light brown. Now add chopped tomatoes, cover and cook till they become pulpy and oil separates. Add the cooked channa along with mashed channa and mix well. Add ½ tumbler (100ml) of water, required salt, sugar and mix well. Now add amchur powder, kashmiri chilli powder and ground masala powder. Mix well and bring it to boil. Finally add in garam masala powder and mix well. Simmer for 5-10 minutes, till oil floats on the surface. Switch off the fire. Top it with lemon juice mixture and coriander leaves. Serve hot with rot, chapatti, paratha, pulka, poori or bread along with sliced onions.